Our big post-Christmas sale has begun! 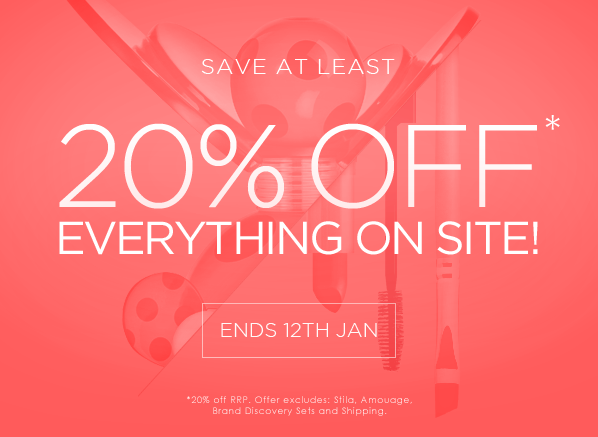 To thank our customers for another wonderful year, we’re offering at least 20% off RRP on everything* until Sunday 12th January, no voucher code necessary. So kick back, indulge in a little guilt-free shopping and get your New Year off to a beautiful start! Shop the Escentual Sale. *Excludes Amouage, Stila, Try Before you Buy sets and shipping. This entry was posted on Monday, December 23rd, 2013 at 5:00 pm and is filed under Bath & Shower, Fragrance, Haircare, Make-up, Men, Offers, Skincare. You can follow any responses to this entry through the RSS 2.0 feed. You can skip to the end and leave a response. Pinging is currently not allowed.